South Plains College accepts transfer credit from colleges and universities accredited by one of six regional accrediting organizations in the United States including the following. Only college-level course work for which credit has been awarded by the institution is accepted in transfer toward graduation requirements at South Plains College. 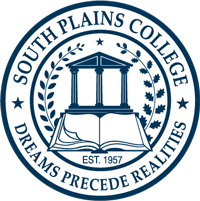 Students who transfer and enroll in a degree program at SPC should meet with a program advisor or the Advising and Testing Center to complete a degree plan and have their prior college record evaluated to determine the amount of college-level credit that will be accepted by South Plains College. Application of transfer credit to specific degree requirements must be evaluated and approved by appropriate department/program faculty and Instructional Division Dean. Only college-level courses will be applied toward a degree program; evaluation of transfer course work is based upon the student learning outcomes and/or program outcomes. Students may initiate a review of transcripted course work from previously attended institutions with the Admissions and Records Office. South Plains College articulates Career and Technical Education (CTE) coursework with high schools. Students enrolled in specific CTE programs of study offered through affiliated high schools may receive semester hour credit for courses identified in articulation agreements and course crosswalk. No tuition, fees or qualification exam will be required for the credit hour courses identified in the articulation agreement. College credit will be awarded without grade point consideration for semester hours. Students must earn a grade of “B” or higher in their high school class in order to earn college credit. College semester hour credit for CTE-articulated classes will be awarded upon enrollment at the college. Hours will automatically be added to the transcript. Credit will be transcribed if a student enrolls at SPC within 15 months of high school graduation. Beyond 15 months, program faculty can recommend CTE-articulated credit be accepted based on approval of appropriate departmental chair and Instructional Division Dean. Earned credit will apply toward the Associate of Applied Arts degree, Associate of Applied Science degrees and the Certificate of Proficiency. CTE articulated credit will not automatically transfer to universities. Credit may be transferred under articulation agreements between SPC and partnering universities based on program by program basis. Students should consult program advisor for additional information. Academic credit may be awarded for learning achieved through the South Plains College continuing education and workforce education programs. Only approved local needs courses and non-credit courses that meet the requirements for credit courses listed in the Texas Higher Education Coordinating Board Workforce Education Course Manual will be considered. Students must meet the same academic rigor as those students taking the course for academic credit, and the instructor of record must meet the academic credentials policies of the College. Students should contact the program coordinator for additional information. South Plains College does not award academic transfer credit for non-credit work. Students may receive academic credit for learning achieved through a professional licensure or certification when it is consistent with the educational objectives of the student, the requirements of the program curriculum and the department’s policy on granting credit for licensure. Credit for professional certifications, licenses and credentials will be awarded when the student can demonstrate that the credentials are equivalent to the same program offered by South Plains College. This includes equivalency with the program courses listed in the Texas Higher Education Coordinating Board Workforce Education Course Manual. Where knowledge, skills and competencies are essential for further study or advancement, program faculty have the option of awarding credit for professional certification based on institutional exam. Students should contact the program coordinator for more information. Students who have completed one year of active duty in the Armed Forces of the United States and who have been discharged or released honorably may receive two semester hours of physical education credit. Students who wish to obtain this credit should submit an original copy of their DD 214 (Member 4) to the Admissions and Records Office. South Plains College makes every effort to ensure that courses taught by the college are fully transferable to other accredited colleges and universities. The State of Texas has developed a common course numbering system for all courses. These course numbers are used in identifying courses that transfer freely among public community colleges and universities in Texas. Students should consult with a faculty adviser when selecting courses for transfer to another institution. The Texas Higher Education Coordinating Board has established procedures to assist students in resolving disputes that arise from transfer of academic credit between institutions in Texas. When a student receives written notification by a receiving institution that credit for a course is denied, an official at the receiving institution or at South Plains College should be contacted. The official at South Plains College is the Instructional Division Dean of the corresponding areas of instruction. If, after 45 days, the dispute is not resolved, the receiving institution is required to notify the Commissioner of Higher Education at the Texas Higher Education Coordinating Board of the denial and reasons for the denial of credit. The Commissioner makes the final determination of resolution and notifies the student and institutions involved.